The first full year of a new presidential administration was marked with continuous political “sturm und drang” (in German, “storm and stress”). Hurricanes caused extensive damage — but thankfully, no mass casualties — in Texas, Florida and Puerto Rico. There was war — again — in the Middle East and terrorist attacks, not to mention mass shootings at a concert and a small country church in the United States. Need we mention North Korea, with its nuclear bombs and missile activities? We’d rather not, but we must. And yet, the concluding year in the Archdiocese of Kansas City in Kansas was, for the most part, very positive. The Deferred Action for Childhood Arrivals executive order was rescinded, but the bishops of Kansas spoke out forcefully for immigrants and migrants and Congress is still expected to take up the matter of the “Dreamers” soon. There was an ordination “boom” this year, with three men ordained transitional deacons, three men ordained priests, and 17 men ordained permanent deacons. And the archdiocese celebrated the centenary of the last apparitions of Our Lady of Fatima. There were sad occurrences, too, such as the closing of Immaculata High School in Leavenworth and the death of Father Jerry Spencer. 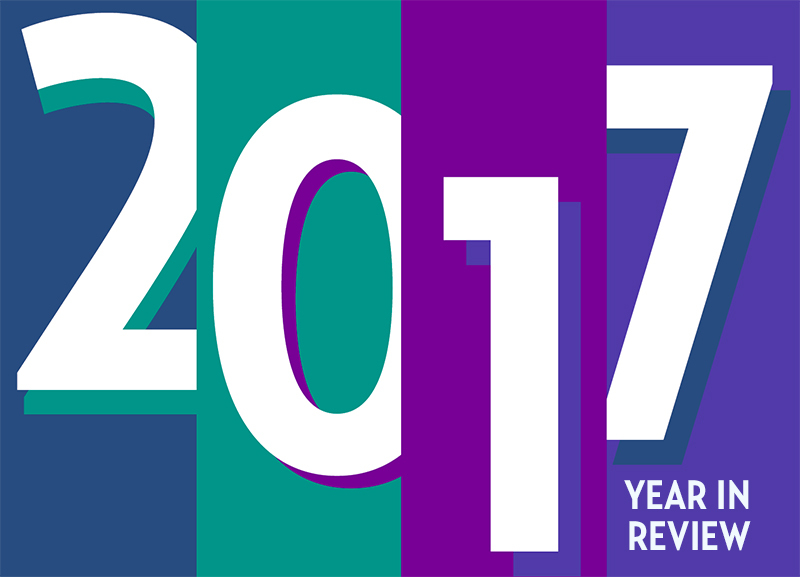 So, before we close the door on the old year, let’s take a look back at the people and events that comprised the life of the archdiocese in 2017. On Jan. 4, the board of trustees of the Leavenworth Regional Catholic School System announced that it would recommend to Archbishop Joseph F. Naumann that Immaculata High School in Leavenworth be closed because of an inability to increase enrollment. Pam Riordan, a member of Holy Spirit Parish in Overland Park, was appointed archdiocesan consultant for children’s catechesis. Retired Col. John Twohig and Deborah Twohig, members of St. Francis de Sales Parish in Lansing, were named honorary chairpersons of the 2017 Archbishop’s Call to Share appeal. The annual Catholic Charities of Northeast Kansas fundraiser Snow Ball was held on Jan. 21 at the Overland Park Convention Center. Benedictine College in Atchison moved its graduate education programs from Roe Boulevard to Mission Road, near St. Agnes Church in Roeland Park. Archdiocesan Catholics joined tens of thousands of other pro-life Americans for the annual March for Life on Jan. 27 in Washington, D.C. Others attended the March for Life in Topeka. Archbishop Naumann celebrated a pro-life Mass in Topeka with the other Kansas bishops and several priests. A march to the state Capitol was held after the Mass. Archbishop Naumann traveled on Jan. 30 to Immaculata High School in Leavenworth for a Q&A session with students before the school’s closing. The annual Support Our Seminarians benefit dinner was held on Jan. 27 at Union Station in Kansas City, Missouri. The former convent at St. John the Evangelist Parish, Lawrence, was moved to a new location on Feb. 1. Construction of a new gymnasium and offices began at the convent’s former location. The Leaven joined about 45 other publications made available to blind and visually impaired persons through the Audio-Reader Network, based in Lawrence. Michael and Patty Morrisey worked with Archbishop Naumann and archdiocesan schools superintendent Kathy O’Hara to establish a pilot sustainability program at eight schools. Cardinal Raymond Burke was the main celebrant and homilist at the annual White Mass celebrated on Feb. 11 at the Church of the Nativity in Leawood. The Mass was sponsored by the Sts. Cosmas and Damian Guild of the Catholic Medical Association. The four Catholic bishops of Kansas — Archbishop Joseph F. Naumann of the Archdiocese of Kansas City in Kansas, Bishop John B. Brungardt of the Diocese of Dodge City, Bishop Edward J. Weisenburger of the Diocese of Salina and Bishop Carl A. Kemme of the Diocese of Wichita — published a joint statement on immigration and refugees on March 3. Benedictine College and St. Benedict’s Abbey in Atchison hosted a month-and-a-half-long exhibition of 25 archival prints and a full-scale replica of the seven-volume, handwritten and illuminated St. John’s Bible. Lawrence Knights of Columbus cleared brush and debris from the historic Catholic cemetery in the former settlement of Franklin, located on the east side of Lawrence. More than 300 volunteers gathered at Curé of Ars Parish in Leawood for a food packing party on March 25 to benefit food-insecure families. The operation was led by local organization Something to Eat. Sister Constance Phelps, community director of the Sisters of Charity of Leavenworth, was elected as one of two new U.S. delegates to the International Union of Superiors General. Christopher Rziha, a senior at Maur Hill-Mount Academy in Atchison, organized an April 8 benefit concert to provide funds to aid refugees in war-torn Syria. LIFE Runners from all over the country met in the Archdiocese of Kansas City in Kansas on April 9. They ended their run with a Palm Sunday Mass celebrated by Archbishop Naumann at the Cathedral of St. Peter in Kansas City, Kansas. The “Living in Truth” women’s conference was held on April 22 at Ascension Parish in Overland Park. The University of St. Mary in Leavenworth received a “2017 Best Value School Award” by University Research & Review. Five Ursuline Sisters of Mount St. Joseph in Kentucky, formerly of the Paola convent, celebrated their jubilees of religious profession: Sister Mildred Katzer, Sister Martina Rockers, Sister Pat Lynch, Sister Helen Smith and Sister Emerentia Wiesner. Queen of the Holy Rosary Parish in Wea held its annual “Running with the Cows” fundraising half-marathon and 5K run on May 13. Archbishop Naumann blessed and dedicated a new altar on May 13 at the Cathedral of St. Peter in Kansas City, Kansas. St. Mary Parish in Hartford celebrated the 100th anniversary of the apparitions of Our Lady of Fatima with a statue of Mary from Portugal on May 13. Amy Joyce, a member of St. Benedict Parish in Bendena and a fifth-grade teacher at St. Benedict School in Atchison, led her family in a mission to help farmers and ranchers near Ashland who were affected by wildfires. She was joined by her children Sam, Abby, Emma and Wade. A group of friends, most from St. Joseph of the Valley in rural Leavenworth County, hauled hay to the affected farmers and ranchers. El Centro of Topeka expanded services to immigrants. Executive director Lalo Munoz has been granted authority to function as an attorney in immigration matters through the U.S. Justice Department’s Recognition and Accreditation Program. Archbishop Naumann, after consultation with the Presbyteral Council and with the recommendation of the archdiocesan youth ministry, asked archdiocesan pastors to begin the process of transitioning their parish’s Girl Scout troops to American Heritage Girls troops. Benedictine College in Atchison was recommended in the 2017-18 edition of “The Newman Guide to Choosing a Catholic College,” by The Cardinal Newman Society. In recognition of her work promoting social justice and peace causes, Sister Barbara McCracken, OSB, was given the Charles E. Bebb Peace Merit Award by PeaceWorks of Kansas City. The Community of the Lamb led a walking pilgrimage May 20-21 beginning in Kansas City, Kansas, and ending at the St. Rose Philippine Duchesne Memorial Park near Centerville. Justin Hamilton and Viet Nguyen were ordained transitional deacons on May 20 by Archbishop Naumann at the Cathedral of St. Peter in Kansas City, Kansas. Deacon Michael J. Guastello and Deacon Daniel Coronado were ordained priests by Archbishop Naumann on May 27 at the Cathedral of St. Peter in Kansas City, Kansas. After 104 years of service to the community, Immaculata High School in Leavenworth graduated its final senior class and closed its doors for good on June 2. The Archdiocese of Kansas City in Kansas softball team won against the Diocese of Kansas City-St. Joseph team 18-17 in the annual Pitching for Priests softball game on June 2. The archdiocese’s second cohort of 17 permanent deacons was ordained by Archbishop Naumann on June 3 at Prince of Peace Parish in Olathe. Archbishop Naumann presided at the blessing and groundbreaking on June 3 of the new monastery for the Little Brothers of the Lamb in Kansas City, Kansas. The annual archdiocesan Corpus Christi procession on June 18 to and from Blessed Sacrament Church in Kansas City, Kansas, led by Archbishop Naumann, featured the Brazilian custom of making a “tapete” — a colorful carpet of sawdust in various designs — on a portion of the route. The archdiocesan newspaper The Leaven won 13 Catholic Press Association awards — and a second place Knights of Columbus Father Michael J. McGivney Award for Distinguished Journalism — at the annual Catholic Media Convention in Quebec, Canada, June 20-24. On June 30, Ascension School, Overland Park, principal Becky Wright donated a kidney to Becca Northcott, the school’s former Spanish teacher. An archdiocesan delegation of 22 people, including Archbishop Naumann, joined others for a convocation of Catholic leaders held July 1-4 in Orlando, Florida. Archbishop Naumann spoke at the 22nd biennial national convention of the Junior Knights and Junior Daughters of the Knights of Peter Claver on July 9 in Kansas City, Missouri. The archdiocese launched a respite care program for children with special needs with the help of a grant from the Kansas Department for Aging and Disability Services. Advancing one of the three “super objectives” of the archdiocesan 10-year mutually shared vision — strengthening marriages — the Joyful Marriage Project was launched by the archdiocesan family life office. Father Anthony Ouellette, pastor of Holy Name Parish in Kansas City, Kansas, was elected chairperson of the steering committee for the Association of Archdiocesan Liaisons to the Charismatic Renewal at the association’s annual convention, held July 20-23 in Pittsburgh. St. Ann Parish in Effingham celebrated its 150th anniversary on July 29. The archdiocese hosted a four-day Totus Tuus camp at Queen of the Holy Rosary Parish in Overland Park for children with special needs. Approximately 125 Catholic ZoTung — an ethnic group from Myanmar (Burma) — gathered for a daylong conference on Aug. 5 at the Cathedral of St. Peter in Kansas City, Kansas. Archbishop Naumann led 30 archdiocesan seminarians to Catholic sites in western Kansas and Colorado as part of the annual seminarians’ pilgrimage, Aug. 7-11. The Kelly Youth Rally celebrated its 20th anniversary on Aug. 19. The Rural Youth Summer Tour “stopped” in Seneca on Aug. 12, in Garnett on Aug. 13 and in Horton on Aug.20. Archbishop Naumann led a Holy Hour during the grand opening of the Gratia Plena House of Discernment on Aug. 20 at Holy Trinity Parish in Lenexa. The house supports women discerning a vocation to religious life. Benedictine College in Atchison and many other archdiocesan schools and agencies hosted viewings of the total solar eclipse on Aug. 21. The first students were welcomed on Aug. 23 into the new preschool at Our Lady of Unity Parish in Kansas City, Kansas, a refurbished former convent. Undocumented persons who were brought to the United States as children, called “Dreamers,” contended with doubt and insecurity when President Donald Trump rescinded the Deferred Action for Childhood Arrivals executive order on Sept. 5. The Ladies of Charity of the United States held their 400th anniversary celebration Sept. 7-9 at the Marriott Downtown in Kansas City, Missouri. Archbishop Naumann was the main celebrant and homilist at a Koinonia Mass on Sept. 10 in Troy, a tradition started by Father Francis Bakyor three years ago. The celebration brought together St. Charles Parish in Troy, St. Benedict Parish in Bendena, St. Joseph Parish in Wathena and St. Francis Africans Catholic Community in Kansas City, Missouri. Archbishop Naumann was the main celebrant and homilist at the 75th anniversary on Sept. 10 of the dedication of Sacred Heart Church and the Shrine of St. Rose Philippine Duchesne in Mound City. He also presented parishioner Michael Martin with the St. Rose Philippine Duchesne Award. El Centro, Inc., of Kansas City, Kansas, honored one of its founders, Richard Ruiz, by renaming its building after him in a ceremony on Sept. 14. Father Jeremy Heppler, OSB, was the main celebrant and homilist at a Mass commemorating the 150th anniversary and renovation of St. John Oratory in Doniphan on Sept. 17. Father Meinrad Miller and Abbot James Albers, both from St. Benedict’s Abbey in Atchison, went to Oklahoma City for the beatification of their relative, Father Stanley Rother, on Sept. 23. Father Greg Hammes, Father Nathan Haverland and Father Scott Wallisch traveled to Berlin to run in a marathon on Sept. 24. Donnelly College in Kansas City, Kansas, held its SHINE celebration and fundraising event on Sept. 28 at the Sheraton Kansas City at Crown Center in Kansas City, Missouri. Archbishop Naumann and priests of the archdiocese attended the annual convocation and continuing education workshop held Sept. 25-28 at Conception Abbey in Conception, Missouri. Carter Zielinski was ordained a transitional deacon on Sept. 28 in Rome. Archbishop Naumann was homilist at the joint Catholic- Lutheran commemoration of the 500th anniversary of the start of the Protestant Reformation on Sept. 29 at the Cathedral of the Immaculate Conception in Kansas City, Missouri. More than 60 artists and craftspeople participated in the Stone’s Folly art festival, held Sept. 29-30, to benefit Most Pure Heart of Mary Parish in Topeka. The Catholic Youth Formation Program at Sacred Heart Parish in Emporia held a Family Fatima Day on Oct. 1 to commemorate the 100th anniversary of the last apparition of the Blessed Virgin Mary at Fatima, Portugal. Lamar Hunt Jr. and Rita Hunt were honored at the 27th annual National Catholic Education Association Seton Awards Gala on Oct. 2 in Washington, D.C.
Archbishop Naumann presided at a groundbreaking and blessing on Oct. 8 at the new site of the future St. Paul Church and School, located at 115th Terrace and Lone Elm Road in Olathe. Archbishop Naumann was the main celebrant and homilist at a Mass in celebration of the centenary of the last apparition of Our Lady of Fatima on Oct. 13 at Queen of the Holy Rosary Parish in Overland Park. “Living as Missionary Disciples” was the theme of the biennial Archdiocesan Convocation of Parish Ministries, held Oct. 13 at Savior Pastoral Center in Kansas City, Kansas. The Catholic Foundation of Northeast Kansas and the Catholic Fine Arts Council of the archdiocese hosted its first-ever Regional Christian Arts Competition on Oct. 17 at Savior Pastoral Center. A traveling first-class relic of St. John Paul II was on display at Queen of the Holy Rosary Parish and Holy Cross Parish, both in Overland Park, on Oct. 19. The Catholic Education Foundation’s annual Gaudeamus fundraising dinner was held on Oct. 21 at the Overland Park Convention Center. Archbishop Naumann was the main celebrant and homilist at a Mass celebrating the 150th anniversary of the founding of St. Patrick Parish in Scranton, as well as the 100th anniversary of the church, on Oct. 22. Deacon Dana Nearmyer, secretary of the archdiocesan evangelization division, was master of ceremonies for a portion of Kairos 2017, an ecumenical charismatic unity and revival conference held Oct. 24-26 in Grandview, Missouri. Cardinal Daniel DiNardo spoke at the event. Members of Sacred Heart Parish in Shawnee went on a one-day blitz vocations pilgrimage to Catholic sites in St. Louis on Oct. 28. Preschoolers at Holy Trinity Parish in Lenexa packed supplies to help students at a hurricane-ravaged school in Houston, and Christ the King Early Education Center, Topeka, hosted an art auction to raise funds for Catholic Charities hurricane relief efforts. The Sisters, Servants of Mary celebrated the 100th anniversary of their order’s foundation in Kansas City, Kansas, with liturgies and special events in November. The Catholic Foundation of Northeast Kansas hosted its annual Deo Gratias appreciation dinner on Nov. 2 at Savior Pastoral Center in Kansas City, Kansas. The honorees this year were the William H. Dunn family and Immaculate Conception-St. Joseph Parish in Leavenworth. Deacon Justin Hamilton was ordained a priest by Archbishop Naumann on Nov. 3 at Christ the King Parish in Topeka. Archbishop Naumann concelebrated a Red Mass for the legal profession on Nov. 3 at Our Lady of Sorrows Parish in Kansas City, Missouri. Archbishop William E. Lori of the Archdiocese of Baltimore was the main celebrant and homilist at the Mass, which was sponsored by the Diocese of Kansas City-St. Joseph, the Archdiocese of Kansas City in Kansas, the Catholic Bar Association and the Catholic Lawyers Guild of Kansas City. Father John Pilcher, pastor of Mater Dei Parish in Topeka, presided at a Nov. 5 blessing and groundbreaking for a new parish hall to be built near the Holy Name Church campus. Archbishop Naumann was elected chairman- elect of the U.S. Conference of Catholic Bishops’ Committee on Pro-Life Activities on Nov. 14 at the bishops’ fall general assembly in Baltimore. The archdiocese sent 466 youths and adult chaperones to the biennial National Catholic Youth Conference, Nov. 16-19, in Indianapolis. Father Mathew Francis, pastor of the combined parish of St. Lawrence in Easton and St. Joseph of the Valley in rural Leavenworth County, became an American citizen on Nov. 17 at the U.S. District Courthouse in Kansas City, Kansas. Approximately 45 archdiocesan parishes and other Catholic ministries and organizations participated in the national #iGiveCatholic crowdfunding campaign on Nov. 28. Betsy Meunier became the new director of the Marian Mantle Group, an archdiocesan prayer and support ministry for those whose loved ones have left the Catholic faith. Father Jeremiah Lee Spencer, long-serving chaplain at the University of Kansas Medical Center in Kansas City, Kansas, died on Nov. 30. The archdiocesan office of marriage and family life hosted a conference on Spousal and Family Prayer at Prince of Peace in Olathe on Dec. 2. A Quo Vadis retreat was held on Dec. 23 for young men discerning a possible call to attend the seminary and explore a vocation to the priesthood. The Serra Clubs hosted the annual parents and seminarians Mass and luncheon at Sacred Heart Church in Shawnee on Dec. 29. “One Thing Remains,” an evening of worship, was held on Dec. 30 at St. Patrick Parish in Kansas City, Kansas.